Twitter adds new features to make it easy to tweet candidly. This time, it has simplified the way of express your thoughts without caring for the 140 character limit. Tweetstorm is a word coined by Marc Andreessen, which means a chain of related tweets posted by a user one after another. This feature gives you the freedom to express your thoughts vividly, without thinking about the 140-character limit. All you need to do is add the number and a slash at the start or end of a tweet, to post it in the same chain as the earlier tweet. Sometimes, you have so much to say but the limit of 140 character limit is simply not enough. Therefore you end up typing or editing the original comment, which is quite frustrating and takes away all your enthusiasm. But with tweetstorm, you can express your thoughts and post complete threads without being interrupted by comments. Although tweetstorms aren’t very common among a large number of twitter users, these new updates could actually bring about a new behavioral change. According to the screenshot shared with Matt Navarra, Director of Social Media for ‘The Next Web’, Twitter lets you write your whole thought or comment behind the scenes and share it all at once. So, in this way, you don’t have to worry about breaking your sequence, or people counter questioning in between. However the feature is not live yet and hasn’t even reached the testing phase according to various reports. To make matters more ambiguous for users, Twitter has not commented on any of this. Definitely, this change would make twitter more popular than ever. Although, we have no option but to wait and watch for this feature to come live! Apple is on the verge of launching iPhone 8 series and with this sudden news of a new member of the iPhone family, it is going to be a spectacular event. COULD WE EXPECT ANOTHER PHONE WITH IPHONE8 SERIES? There has been a hype of Tenth anniversary of iPhone from quite some time. There were speculations all around about the iPhone 8 and 8 Plus make and specifications but just on the verge of the big event, a rumor was spread. According to the App and game developer Steven Troughton-Smith tweet, Apple is not only launching iPhone 8, 8 Plus and Apple Watch 3 but also a special edition iPhone marking its Tenth anniversary. WHY X AND WHAT’S NEW? You must be thinking why X. 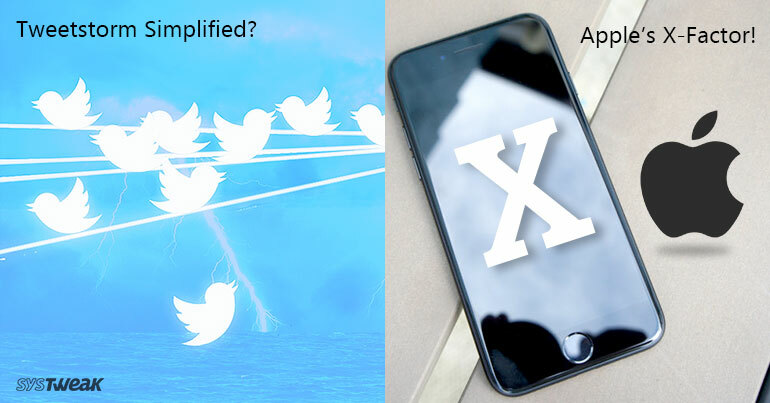 Well, it is indeed the tenth anniversary of iPhone and X stands for Ten in Roman Numerals. So, more or less, it makes sense, if that’s gonna be the name. As per Bloomberg, “iPhone X would be the premium version possessing all the good features like improved cameras, crisper OLED screen, with a 3D facial recognition scanner replacing the fingerprint scanner for unlocking the device.The premium model will not have a home button but will use a series of gestures to control the device instead. According to a leaked code, the sensor could be used to scan a person’s facial expression and turn it into emojis for messaging. Moreover, the code also leaked a photo of the Apple Watch 3 which shows that the watch would have a red button on the side and dots in the middle of the screen to show cellular signal strength. It also indicates that with the watch, you will be able to make phone calls without an iPhone in range. However, as with iPhone 8 and iPhone 8 Plus, X will get faster processor as compared to iPhone 7 models.